Online and blended – what’s all the fuss? We’re not alone in wanting to explore the opportunities and challenges of holding events online, or blended face-to-face (f2f) and online. Suddenly the web is full of courses and primers on how to do it, like this first in a series of webinars from the deeply experienced Martin Galbraith, or this one on virtual collaboration from Grove. And in our blog on Coming to Agreement in meetings we highlighted the great resource on web meetings just released by the wondrous Nancy White. Everyone’s talking digital. 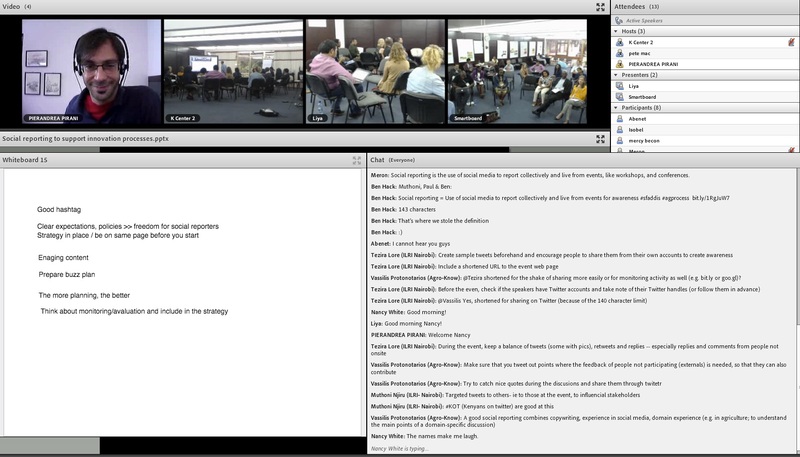 Today was the online introduction to the three-day Facilitation Anywhere course, which begins next week. It was wonderful to meet the participants, after all our preparations, and we’re both excited – and properly apprehensive – about next week. After several introduction exercises, increasing the bandwidth as we went along – from text chat to video and audio – we introduced some of the concepts underpinning our design. Apart from big, all-purpose events, most gatherings engage a group of people with a common purpose. This could be a product they need to develop together, or some planning, or some ideas they need to work through in detail, or a programme they want to share experience and learning on. But of course a whole range of personal, emotional, social and organisational currents operate in and around the formal agenda. And the level of a specific ‘topic thread’ around blended and online learning. 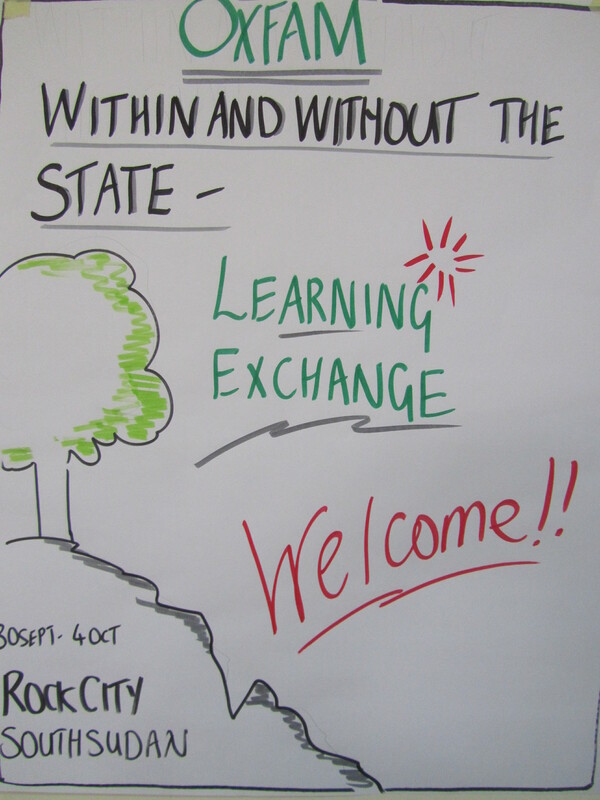 How can we maximise engagement making full use of participatory f2f approaches and digital tools or channels? As we start it’s interesting to reflect on our own experience over the months we’ve been thinking about and designing the programme, since we come to the event with very different digital trajectories. Pete: “I’ve been involved with things digital since the introduction into UK public education of the early mass-produced PCs in the mid 1980’s. In the 1990’s I began working online, riding the Internet wave into Oxfam GB, infuriating some and enthusing others (only a few at first) with email and talk of global networks. I’ve been using online communication channels since that era. I’m still an enthusiast, less for the tech. itself than for what it can enable people to do, especially how it can link, connect, enable people to collaborate and communicate”. So I’ve always enjoyed experimenting with and learning how to integrate social and online digital media into events I facilitate. We’ve both been living the process of blending deep experience in face-to-face facilitation with online technologies, feeling what it’s like introducing and being introduced to the possibilities opened up by the new digital platforms. We’re looking forward enormously to exploring the issues with the participants, and will be reporting back here on how it goes – what people say, how we’ve learnt and what is changing about our own practice. This kind of blockage, a feeling of wading in treacle at a crucial point in an event or process, is something we often face as facilitators. Sam Kaner has been writing and teaching about participatory decision-making processes for over 20 years . Kaner invented the term groan zone, also called, ‘the zone of struggle in the service of integration’, which perhaps sums up the issue more accurately (if less elegantly!). If the emergence and sense-making phase described in our previous blog has gone well then ideas have emerged, new combinations of activities are possible, assumptions have been challenged and fresh groupings of people have formed around agreement and difference. So everyone in the group has to struggle in order to integrate new and different ways of thinking with their own. Once power and hierarchy, not to mention gender and difference, are layered into the situation …. kaboom! If you don’t learn enough about the power dynamics in the group at the outset and clarify who has the authority to hold (or block) decisions, the process can become unstuck. Detailed and clear preparation can help groups anticipate and get through the ‘groan zone’. Breaking down the agenda into topics, questions and likely outcomes are part of that preparation and inform the design of the process – and being able to let it go in the moment. Equally important is the need to be clear about what agreement looks like. Consensus is often thought to mean ‘we all agree’. But as Sam Kaner points out, consensus isn’t so much the end point as how you get there – ‘a participatory process in which a group thinks and feels together en route to their decision’. The agreement itself might be unanimity or majority. The process of getting there is all important – hearing objections, exploring resistance, drawing out proposals and possible ways forward, listening for the ‘sense of the room’, testing for agreement until you get there. In many types of events there isn’t the same need for agreement, or an agreed outcome. Knowledge Sharing meetings are about people talking, learning from each other’s experience and taking away ideas to be processed individually or in teams. Good documentation and processes that help individuals or teams articulate what it is they’ve learnt and find common threads and patterns can help ensure that people come away with a sense of achievement. These often involve loads of paper on the walls – or windows, or large pieces of old wallpaper, or fabric sheets sprayed with glue – wherever they can be stuck. The majority of gatherings come as one event in a long series of activities and processes, involving chains of document versions and conversations before and after a workshop. Being crystal clear about the purpose of an online meeting, and preparing in detail, is even more important than for face to face meetings, as is stressed in a very accessible introductory guide to WebMeetings just published by the truly awesome Nancy White. Some things can be easier. Online collaboration tools make it easier for people to keep track and maintain common documents and other content. We regularly use Google documents, wikis, and MS OneDrive (yes, Microsoft have finally made a usable, publicly accessible web collaboration tool!) These tools can serve a real-time documentation function and, paradoxically perhaps, if all participants remain online then keeping track can be easier. Conventions of version management are often more scrupulously followed online since people haven’t got the face to face contact to fall back on. There is only each other and the online connection. Many of the tools for finding common ground and identifying difference can be used online. If people are using common tools like Google drive, which supports shared editing in real-time of presentations or other documentation, then coming to agreement can be a straightforward process. If more is at stake, there are plenty of examples from multi-stakeholder policy processes of ways to bring together and engage people who are present in meetings both remotely and physically. Many UN and other multilateral bodies are developing and using sophisticated platforms supported by formal process for responding and decision-making, especially those concerned with the Internet and telecommunications. The International Telecommunications Union, for example, has been webcasting since 1998 and integrating Remote Participation since 2009. Dealing with difference and disagreement online is hard. Visual and other non-verbal cues are often absent or unclear unless there is high quality equipment and good communication channels. The specific attributes of online meetings referred to in earlier blogs, such as extended response times, attention spans or comprehension difficulties, can cause acute problems where there are tensions or challenges. It requires more deliberation from a facilitator – ensuring consistent turn taking, regular check-ins, allowing time for rounds of conversations about key issues. Good facilitator skills in listening, echoing and summarising and synthesising are absolutely crucial. Do you have any stories of how you sailed through the groan zone? 1. Kaner’s Facilitator’s Guide to Participatory Decision Making should be on all shelves or e-readers! All meetings are different, as different as the people within in them. So in our sense-making of the processes and practices that help to foster fun and engaging events, we’re acutely aware of the risks of talking about a ‘typical’ flow of activities, as we’ve been doing in the first and second of these blogs. Having shared that caveat, we’re going to continue! This blog looks at another stage in the progress of a workshop or event – generating and shaping ideas. You’ve got the information out there, and you’re getting clear on your challenge and the opportunities. It’s tempting to jump straight to solutions, and stay safely in the comfort zone of the tried and tested. Striking out and taking a different pathway, into those unknown places of the imagination, where weird and wonderful ideas reside, opens out new possibilities. The best ideas have a way of appearing at funny times, and there are lots of tools to help, from the simplest brainstorming, through to the panoply of design thinking methods, such as those shared by IDEO. The key thing is to create the conditions for the unexpected to happen. Brainstorming is one of the oldest and best known methods for generating and sharing ideas. Though as this wonderful cartoon comments, anything other than the lightest of touches in facilitating the process can be crushing! Since we’re sharing resources, this cartoon comes from the superb Rob Cottingham, who gets even more karma-points by licensing his work as creative commons. Another very rich source of resources, ideas, innovation and support comes from the bustling folks at Liberating Structures. They’re more than a resource – they’re almost a movement. They’ve gathered together on their site (and in their training programmes) a collection of approaches and methods designed to, “introduce tiny shifts in the way we meet, plan, decide and relate to one another…. (putting) the innovative power once reserved for experts only in hands of everyone”. Some of the ideas you’ll recognise as old favourites, others were certainly new to us, and others are carefully worked variations. Another major strength of the site is that they have defined a useful and practical format to enable people to understand how they would use the methods in events or workshops. As with so many methods, they can be adapted for different situations. For generating ideas we like particularly 1-2-4-All (which you may know as cascade! ); 25-10 crowd sourcing and the riskier but therefore potentially more fun and releasing of creativity, improv prototyping. And they’re also systematically exploring how to adapt methods to working online. Our job is to hold the sense of possibility for the group. Internally, that’s about suspending judgement and being ok with not knowing what’s going to happen. Outwardly, that helps us create the ‘container’ – the space where people open out and draw on their imagination and creativity to access their best thinking and ideas. We so often characterise online or blended meetings as problematic, needing special preparation and attention to the technology and how people will interact. However, there are also many benefits and advantages to being present online rather than physically present. We ran some experiments recently during a wonderful exchange of creativity and experience, the AgKnowledge Innovation Process ShareFair (yes, bit long but it made sense at the time!). We were using the event to work – play – with different modes of presence. Some of the sessions were organised as blended, combining face to face with online channels. Pete was working at the event in Addis Ababa while Isobel attended some of the sessions remotely. We used Adobe Connect for the blended sessions, illustrated below, recordings of which are linked in this blog. In the context of ‘ideation’, we observed that brainstorming, for example, worked faster online than face to face: there was an immediate record of what had been written into a chat window, online participants were able to type at their own speed, without drowning out others, and the process was less reliant on a facilitator to manage participation, record the findings. Use of polls also allowed a more or less instant prioritisation of ideas, without having to fiddle about with dots or bits of paper. In your experience, what’s the best way to carry forward both the tangible and intangible elements of the ‘container’ into online spaces?